I’m originally from Snyder, Texas, but I have been here in the Falls since 1990. I have been in the automotive industry for 6 years and before that spent 26 years in retail management. Customer service is my passion. I have been married to my best friend since June of 1994. Brenda is the Office Manager for Star Image Dentistry. We have 4 daughters and 7 grand-kids that I love spending time with. In my spare time, I enjoy golf, camping, and watching the Dallas Cowboys. Winning or losing I’m a lifelong Cowboys fan! I also enjoy being a part of the Texoma Community, United Way, CMN, March of Dimes, MDA, and Meals on Wheels. These are just a few of the many area organizations that I have been a part of in one way or another. It’s always exciting to get out and serve our great community! I’m from right here in Wichita Falls, TX. I have been in the automotive industry since 2012, all of which has been spent with the Patterson Family of Dealerships. Prior to sales, I’ve had a variety of careers ranging from mental health to law enforcement. I have been married to my beautiful wife since 2012 and have two daughters. In my spare time, I enjoy going on road trips and looking for hole-in-the-wall burger joints. I also enjoy family game nights, golfing, and playing with our two dogs. I count it a blessing to be able to come to work every day. 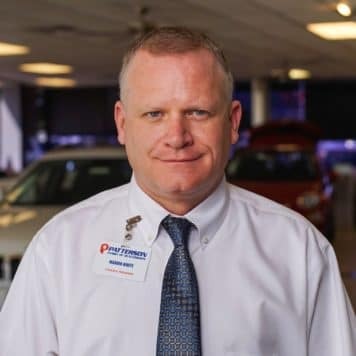 My goal is for Patterson Kia to provide excellent service with integrity and transparency to all clients and for the Patterson Team to always do what they say they will do. I was born and raised right here in Wichita Falls, TX. I have lived here all my life! I have been in customer service for 5+ years as well as a Manager in retail for 3 years. I enjoy working with others. I was so glad to be given the opportunity to work at Patterson Kia. I have 4 wonderful kids, 3 boys, and 1 girl. In my free time, I enjoy spending time with my grandchild. We like to travel and do road trips. My goal is for Patterson Kia to provide excellent service to all clients. I look forward to meeting with you! I am blessed to be able to come to work every day and work with great salespeople as well! I am originally from Grandfield, Oklahoma, but I have lived in Texas for the last 16 years. I have been married to my husband Terry for 10 years. Between us we have 4 daughters, 17 yr old Camee, 15 yr old RenaeLeigh, 12 yr old Carsyn, and 3 yr old Jaylee. I come from a family of military vets, including my husband, who is an Air Force vet. I just want to say Thank You for your service to all vets. In my spare time I enjoy just hanging out with my family whether it be sports with the girls, all of us making dad go shopping, or watching football on the big screen (Hook’em Horns). My goal is to provide excellent customer service and make lifelong friends/clients. If you are in the market for a new or used vehicle, please contact me and let me assist you. Hello my name is Tim Howell. I have been in the car business since 2016, most of which has been spent at Patterson Auto Group. I have experience in dealing with all DCJR as well as Ford-Lincoln models. 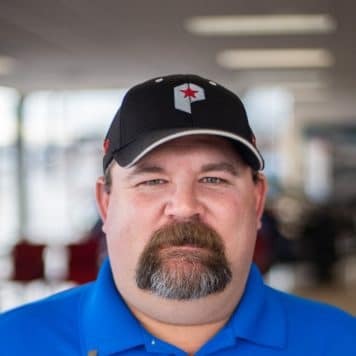 I am currently located at Patterson Kia and have been here since 2018. I have 5 boys that push my (best friend and rock) loving wife Shawna and I to the end of our ropes! I grew up in the Wichita Falls surrounding area. Prior to the car business, I spent the previous 17 years in the farming and ranching business. My goal for friends and customers that I am blessed to meet and assist is that they know they are working with someone with a God fearing character, integrity, and honesty. I am very grateful to work for Patterson Auto Group, and have all plans to be around for as long as they can stand me! I look forward to meeting you! I graduated in 2015 from a small town I grew up in called Alvord, Tx. After graduation, I got my first job in the customer service industry. I first moved to Wichita Falls in August of 2015 to attend Midwestern State University, and I fell in love with the town. I moved back to my hometown in November of 2017, and I missed Wichita Falls too much and decided to move back in July of 2018 with my girlfriend and our two dogs Kodak and Delilah. In my spare time, I’m usually either playing with our dogs, going to the movies, or watching The Walking Dead. I joined the Patterson Kia team in 2018. My goal is to get my customers into a vehicle they love, as well as give them a great experience unlike any other while doing so. If you are in the market for a new or used vehicle, I’d love the opportunity to earn your business. Come see me! Chris was born in Denison, TX and has been in Wichita Falls since 2009. He’s a Christian, a father to four beautiful young ladies, and a husband to his best friend, his wife, Sara. 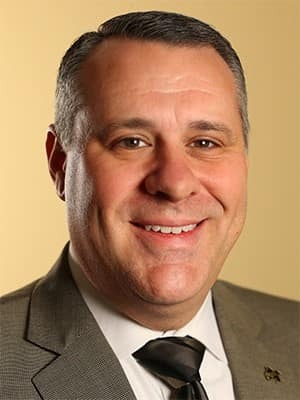 Chris has been a general manager and sales manager in the world of broadcast media in both radio and TV, an operations manager and controller in manufacturing, a national business consultant, a small business owner, and a public speaker in places like Phoenix, Nashville, Chicago, Tampa Bay, Dallas, Oklahoma City, Los Angeles, and even Wichita Falls, TX! His most memorable job was working at a Chinese restaurant as a teenager! Make sure you ask him about it! My name is Alegra Finley. I graduated from Crowell High School in 2009. I currently reside in Vernon, TX and commute to Wichita Falls daily. I am happily married with two handsome boys. I have been employed with Patterson Auto Group for nearly 5 years and truly enjoy my job! My name is Mona Martin. I am a current resident of Wichita Falls, but originally from Chicago, IL. I started my family after graduation, and have three lovely daughters. I have been in the car industry for almost 5 years with Patterson Auto Group. I have enjoyed every moment of it. My name is Brandy Nash, a resident of Wichita Falls. I am a mother of three loving kids and devoted wife to my husband Byron Nash. I am always up for a challenge at any given time. I love family and friends and will go above and beyond to help others. Crystal Perez was born in Lubbock, TX but raised in Wichita Falls, TX. Graduated from Hirschi High School. Loving and dedicated daughter and sister. Oldest of three. Always willing to lend a helping hand. Makeup, fashion, and technology aficionado. 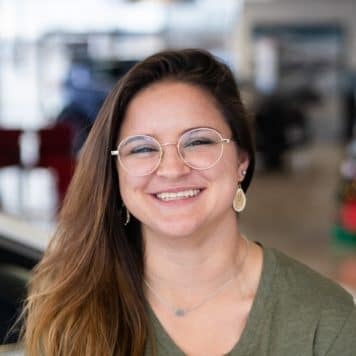 Employed at Patterson Kia July and truly enjoys what she is doing.